It’s dazzling; almost blinding. A shimmering sea of white stretching miles over the pancake flat desert plain encircled by distant hills. Mounds of salt crystals pepper the landscape in tidy equidistant rows. Translucent pools of water shimmer in the sun, softening rectangular patches of hard-packed salt for future harvest. Salinas Grandes in northwest Argentina is the second largest salt flat in the world, formed over thousands of years. At high altitude in this dry region, evaporation exceeds precipitation. When the summer rains come, the water does not seep into the sub-terrain. Instead, it vaporizes, leaving behind layers of white salt minerals that accumulate over time. The salt is actively mined here at Salinas Grandes and exploring is free. As a salt lover, I just wanted to lay down and lick the saline ground! Lesser known, however, is the highway that runs through this vast isolated flatland all the way to the Chilean border. Argentina’s Route 52, which begins in the village of Purmamarca at the junction of Route 40, is one of the highest roads in the world. Winding through colorful geological formations in and around the Rainbow Valley region, it’s also one of the most beautiful. Keep your eyes peeled for vicuña, small wild llamas that roam the grasslands. The Lipán Slope (Cuesta de Lipán) is a section of Route 52 that zig zags back and forth up and over a high mountain pass. Save your lunch for after this switchback!! In a span of 10 miles, the Lipán Slope ascends from ~7,000 feet (2,192m) in elevation to almost 14,000 feet (4,170m) at Abra de Potrerillos midora (viewpoint). The road then winds down the other side to Salinas Grandes at 11,300 feet (3,450m). 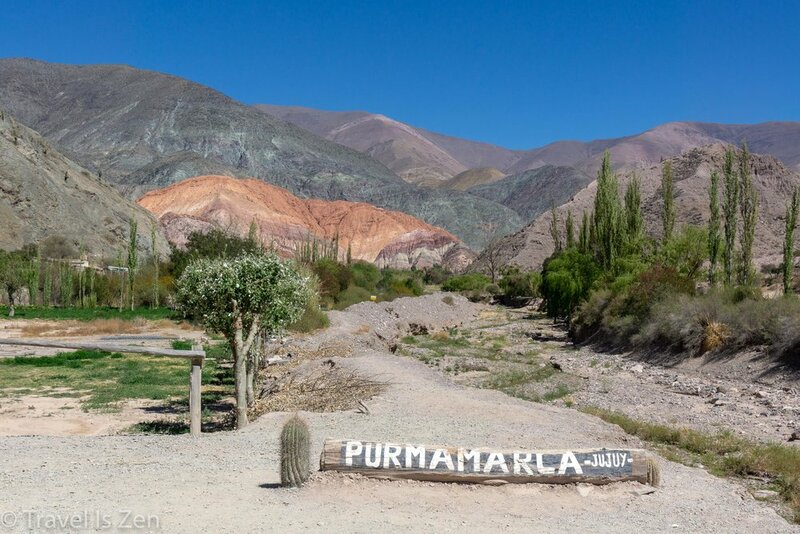 The Seven Color Hills of Purmamarca are a feast for the eyes and worth a stop on your way to Salinas Grandes from Salta, Jujuy or Tilcara. f you’re in need of a leg stretch, the Paseo de los Colorados trail leads you to a front-row view of the colorful hills in the desert. This town in Rainbow Valley has been transformed into a tourist shopping zone, but still retains its original Andean character. If you are looking for souvenirs — such as llama or sheep wool sweaters, blankets, or hats — Purmamarca is as good a place as any to make your purchases. They have some unique items that you won’t find back in Buenos Aires or further south in Patagonia. Get ‘em while you can! Maybe try a bowl of stew and an empanada, as well. Famous in this region! 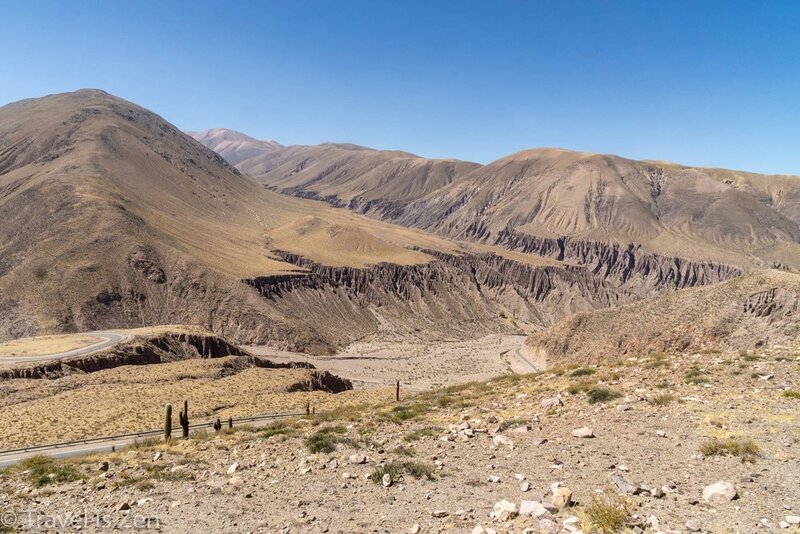 The road trip from Salta to Salinas Grandes via Route 40 and Route 52 is about 150 miles (250 km), with an estimated driving time of 3.5 hours one way. Of course, you will stop for meals, photos, and site seeing, so allot a full day for this excursion (10+ hours). If you stay in Jujuy, the trip is less than 100 miles and will take just 2 hours one way. We stayed in Jujuy and made several day trips along the northern part of Route 40, including an off-the-beaten-path adventure to Humahuaca’s Fourteen Color Mountain (Cerro de Catorce Colores) and a visit to Pucará de Tilcara. Do you have any road tripping tips for travelers? Or maybe a few key phrases in Argentinian Spanish to share (double L’s are pronounced “sh”… e.g. pollo). Comment here or tag @traveliszen on social media. Happy travels!